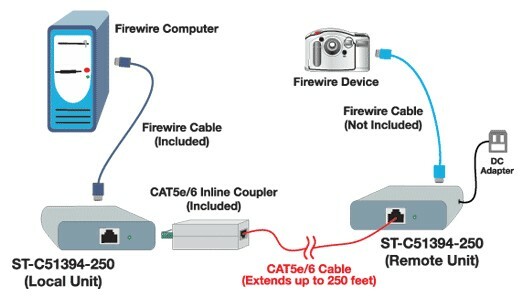 ST-C51394-250 extends one FireWire device up to 250 feet using CAT6 cable and 150 feet using CAT5e cable. Compatible with IEEE 1394-enabled PC and MAC computers. 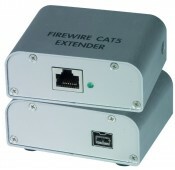 Compliant with 1394b and 1394a standards. One female IEEE 1394b 9-pin connector on each unit. One female RJ45 connector on each unit. Use the included inline coupler to enable proper communication between local and remote units. 6-inch 1394b bilingual male 9-pin to 1394a male 6-pin cable. Male-to-female CAT5e/6 RJ45 inline coupler.